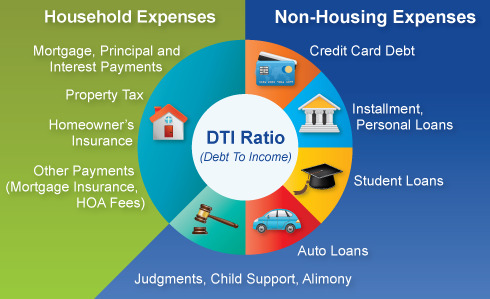 What is a debt-to-income ratio? Why is the 43% debt-to-income ratio important? Answer: Your debt-to-income ratio is all your monthly debt payments divided by your gross monthly income. This number is one way lenders measure your ability to manage the payments you make every month to repay the money you have borrowed. Evidence from studies of mortgage loans suggest that borrowers with a higher debt-to-income ratio are more likely to run into trouble making monthly payments. The 43 percent debt-to-income ratio is important because, in most cases, that is the highest ratio a borrower can have and still get a Qualified Mortgage. There are some exceptions. For instance, a small creditor must consider your debt-to-income ratio, but is allowed to offer a Qualified Mortgage with a debt-to-income ratio higher than 43 percent. In most cases your lender is a small creditor if it had under $2 billion in assets in the last year and it made no more than 500 mortgages in the previous year. Larger lenders may still make a mortgage loan if your debt-to-income ratio is more than 43 percent, even if this prevents it from being a Qualified Mortgage. But they will have to make a reasonable, good-faith effort, following the CFPB’s rules, to determine that you have the ability to repay the loan.
" James - You were so incredibly helpful during this process. You had answers to all my questions and acted promptly when things were needed. You communicated extremely well and always listened to my concerns. I really appreciated all of your effort in seeing this sale to the end. Thank you! " " "I am completely satisfied with the job James did and plan to use his services in the future. He helped me sell my home and find and purchase a new one. He went above and beyond to help me get what I wanted. He is always on top of things. He shows everyone the utmost respect. His vast knowledge and willingness to help with unique requests is very impressive. I would recommend James to anyone who wants to be satisfied with a purchase of a home." "
" I cannot tell you how much I appreciate what you did for me and my family. Your knowledge and willingness to do whatever was necessary made the process very easy for us. You made us feel comfortable and informed during a difficult time. I am extremely pleased with how everything turned out and would definitely recommend you. Thank you. " " I can't thank you enough for all your hard work, patience and diligence during my house hunt. I love my new home and it is perfect for me. I highly recommend you to family, friends and co-workers buying or selling a home. You are awesome!- "
" Jim's ability to respond to our wishes were all we could have asked for. If we were to again need the services of a Real Estate agent, we would not hesitate to employ his services again and highly recommend him to anyone needing a Realtor. Top Qualities: Personable, Good Value, High Integrity "
" Your knowledge and expertise in the process really help me understand the steps to home ownership. The financial expects you directed us to were also easy to talk with and knowledgeable. We were able to purchase a home for exactly the payment we could afford and got much more than I ever expected. Thanks James! " " "I hired James after firing my previous real estate agent. James was everything my previous agent was not. I was most impressed with his advanced marketing knowledge. I noticed almost an immediate increase in the number of showing of my property after hiring James. It was only a few months later that my property sold. I would hire James again and I enthusiastically recommend his services to anyone needing the service of an expert Realtor." "
" Thanks for all of your hard work. You had to fix a leaky pipe, risk your life with a hack job wiring system for the water, spend 6 months dealing with lenders, dealing with a house that was not in any kind of showing shape, AND dealing with sellers (us) that had no interest in helping sell the place, and had trouble dealing with the emotional side of it too. And, you messed up your arm in the middle of this mess too. I never said thanks....so here you go....Thanks! I'm really glad that I got to meet you through Mike and I'm glad I chose you to handle this. I have nothing but good things to say about you man, you really did a great job. I never thought it would sell, and never thought it would close...I believed the whole process was a waste of time. But, you made it happen and did your best to look out for the interest of everyone involved. I'm glad to see you got paid on it...whatever it was...it was not enough. I hope you and your family get a nice dinner or something out of it. I'd happily recommend you to anyone. " " "James has been a great broker. My husband and I are really satisfied with the job he did. I need to highlight that he is very responsible, punctual and confident person. We now have a nice house thanks to James who gave us the time we needed to finally get what we always wanted. We definitely will work with him again." "
" I just wanted to thank you for the great job you did in helping me buy a house. As a first time buyer you were there 100% for me you answered my questions on a timely basis. You pointed me in all the right directions, you were right on target with everything and because of that the process was very smooth for me. I appreciate the way you called me and kept me focused on what I needed to do. If it was not for you I would not have gone through with the process, so I thank you a lot for your patience and hard work. I will recommend you to anyone who needs a Realtor. Good Luck. " " James, It is nice to know I can count on someone in this day, Thank you! " " Hi James, I'm writing to express our appreciation for your help and sincere direction to see that we secure this new home for our family. Thank you so much, God Bless you and continue to open his door for you. Secondly, we are inviting you with your family to stop by on Sunday July 29th, 2012 @ 5pm to our new home. Thanks. "